A Primary One pupil’s bravery inspired a Stirling school to ‘go orange’ and raise funds for research into Duchenne Muscular Dystrophy. 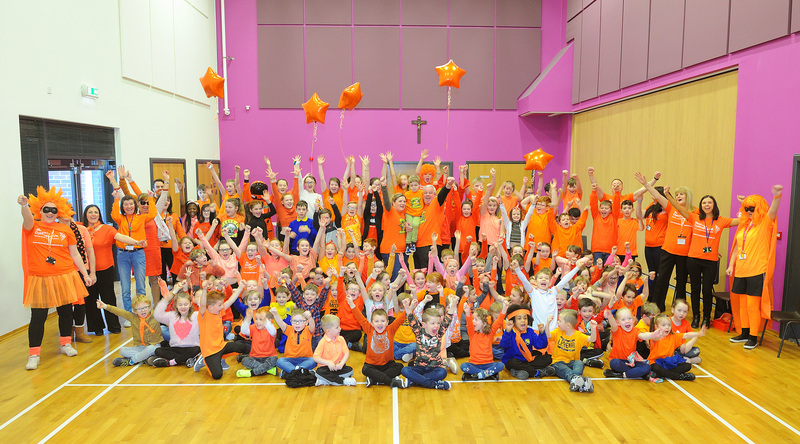 Children at St Margaret’s Primary in Cowie donned orange clothing on Friday (Feb 1) in a show of support of five-year-old Somhairle McMenemy, who battles the serious muscle-wasting condition every day. It was part of a national day of action by Muscular Dystrophy UK (MDUK) which encourages people to wear something orange or put on sunglasses and make a donation to the charity. The event was embraced by the school community, with the catering department producing a special ‘go orange day’ menu and the Parent Council providing free fruit to every pupil. The school also organised a special ‘orange assembly’ which was attended by Somhairle’s parents – Sarah and Gerry, who live just outside Cowie. Gerry said: “We never knew much about Duchenne Muscular Dystrophy before Somhairle’s diagnosis in August 2017, and that’s understandable as it’s such a rare and cruel condition, with only 2500 people in the UK living with it. “We are overwhelmed but of course delighted that the whole school community has rallied round and embraced the national ‘Go Orange for a Day’ campaign. Every penny raised supporting ‘Muscle in with Somhairle’ goes to the Duchenne Research Breakthrough Fund. Headteacher Paul Nugent said: “Somhairle battles with duchenne muscular dystrophy every day and is an integral part of the St. Margaret’s Primary School family. “His strength and positivity is an inspiration to us all. Far from being downcast or negative about his condition, Somhairle fights the symptoms head on and continually educates those around him on how his body is changing. A total of £400 was raised from the event and it will be ring fenced for the MDUK Duchenne Research Breakthrough Fund. Muscular DystrophyUK Regional Development Manager, Dean Widd said: “The support shown for Muscular Dystrophy UK’s family fund, ‘Muscle in with Somhairle’, in this year’s national ‘Go Orange for a Day’ by the staff, children and parents of St Margaret’s RC Primary has been truly inspiring. “Raising awareness and vital funds, while educating the children about muscular dystrophy, by participating in Go Orange for a Day has proved to be a great success at St Margaret’s RC Primary.